Perhaps not everybody knows that Giacomo Puccini, whose works are among the most beloved and performed in each part of the world, is the last member of a long musical dynasty has been perpetuated for five generations. The progenitor was Giacomo, or Jacopo, Puccini. He was born on 26 January 1712 in a big and already old house in the small village of Celle of Pescaglia. When he was still young, he moved to Lucca where, after studying music in Bologna, he came early to the top of the musical organization of the town as organist at the Cathedral and Choirmaster of Palace. After him there was Antonio, Domenico and Michele, Giacomo's father and the last musician Puccini in Lucca. The house of Celle, with its land, was owned by the family, but after the untimely death of Michele Puccini, his wife Albina was forced to sell it to support her large family. So Giacomo, during his childhood, used to spend his holidays with joy and lightheartedness in Celle. This small village was always in his heart and its memory resurfaces often in letters written to his sister Ramelde. Giacomo went there for the last time on 26 October 1924, just over a mouth before his death, for a ceremony in his honor at which was placed a plaque on the front of the house of his ancestors. 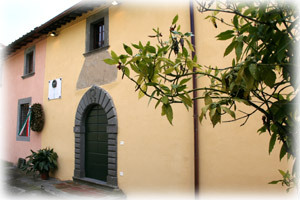 That house in 1973 went back to be “The Home of Puccini”. Thanks to the generosity of Ramelde's daughters, Albina and Nelda who donated many precious heirlooms, and to the sensitivity of the “Lucchesi nel Mondo Association” who acquired the property, the ancient house of Puccini became a museum. Over the years it has enriched and improved until the last complete remounting made in 2008, during the celebrations for the 150th anniversary of the birth of Giacomo Puccini. Until the last precious acquisitions; in 2009 and 2010 the Giacomo's great-granddaughters donated 13 letters and 13 autograph musical manuscripts containing drafts for the writing out of “Le Villi” and “Edgar”. 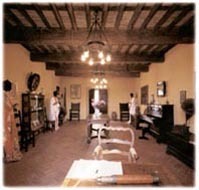 The Puccini's museum in Celle, real house-museum, is formed with seven rooms located on two floors. Inside, there are displayed photographs, autograph letters and musical manuscripts and precious objects belonging to the Master. Through these objects you can retrace his human and artistic vicissitudes. After entering in the large hall, used as an entrance, you can immediately feel the sensation to go into the story. The great Puccini's family tree and the portraits of ancestors (Giacomo senior, Antonio and Domenico), hang on the left wall, take us back in time and give us the right perception of being in the place where the long story started. Immediately after, the visitor's glance is drawn to the piano where Puccini composed part of “Butterfly”. Over, hang on the wall, is exhibited the laurel wreath that Giacomo brought to the death-bed of his mother. It has been donated to him after the success of his first opera, “Le Villi”, staged for the first time at Dal Verme Theatre in Milan on 31 May 1884. In the hall, there are also the favorite armchair of Giacomo Puccini and the gramophone, that was donated to him by Thomas Alva Edison. Every year, in spring and summer, is mounted an theme exhibition. 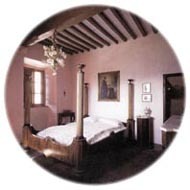 In the next room, there are furniture of the Michele Puccini and Albina Magi's bedroom in their home on “Via di Poggio” in Lucca: the toilet, the dresser with its mirror, a bedside table and the double bed, where on 22 December 1858 was born Giacomo. Of particular interest is the picture, hangs over the bed, attributed to the painter of the eighteenth century Giuseppe Antonio Luchi called the Diecimino. La corona ricevuta da Puccini alla prima rappresentazione dell'opera "Le Villi" nel 1885. 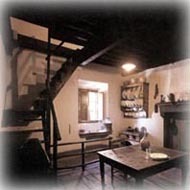 After you have seen the kitchen, the same as two centuries ago, through a wooden stair you reach the upper floor. The first room is dedicated to the Giacomo's family. There are the portraits of his parents, his sisters and his brother Michele, but also his maternal uncle Fortunato Magi; a talented composer, and Michele's cousin; Nicolao Cerù that economically helped the studies of Giacomo in Milan. From this period date the letters written to his mother and his brother Michele to recommend commitment to the study. The letters, displayed in the glass case, refer to the results of exams at the Conservatory. In the small room on the right, there are some objects of the family: the baptism dress of Giacomo, the crib, the desk where his father worked, the sewing machine and the wooden box for the sewing works of his mother. In the glass case are exhibited the “Celle's Code” (a manuscript of eighteenth century of the family library), three manuscripts of Giuseppe Carretti; teacher of Giacomo Senior and his son Antonio in Bologna. There are also a treatise of Michele Puccini, some autograph manuscripts of his brother, one of which contains the “Gavotta” made by Giacomo for the second act of “Tosca”. Then you can see the reduction for piano four hands the last movement of “Quartetto in Re” (Quartet in D) and the solo of piano of the “Minuetto in La maggiore” (Minuet in A major). The third room is dedicated to the affectionate relationship between Giacomo Puccini and his sister Ramelde, the brother-in-law Raffaello Franceschini and their three daughters, but also to the love for the small village of his ancestors. In the first glass case are displayed the portraits of Remelde, her husband Raffaello Franceschini, their daughters, some photographs of Giacomo with dedication, a playful letter written to his brother-in-law and others to his sister with references to his work and to the representation of his operas. The letter sent on 13 July 1887 from Caprino Bergamasco talks about the composition of “Edgar”, while the others refer to “Bohème”, “Butterfly” and “Fanciulla del West”. Of these operas, exhibited in the two small glass cases, you can admire the score with the autograph dedications of Giacomo. In the big glass case are exposed autograph parts and drafts of manuscripts of “Le Villi” and “Edgar”. The second one is dedicated mainly to the big passion of Giacomo for the hunting and to his interest in the modernity and in particular in the means of transport. There are caricatures that Giacomo made of himself and his brother-in-law. Besides, some postcards to his brother-in-law in which the musician talks about hunting and the usual appointment for hunting in the lands of the Marchese Ginori on Lake Massaciuccoli. There is also a letter of 1895 dedicated to the bicycle, and a photograph of Giacomo with a cycling group in Pescia. The bicycle quickly became an obsolete means of transport, so in 1901 Giacomo Puccini bought his first car. The passion for cars accompanied him throughout his life. In some letters shown, he talks about cars and the incident occurred on 25 February 1903 (documented by photographs taken by his friend Alfredo Caselli). In the letter sent to his sister from Lausanne on 20 September 1910, we find a detailed and passionate description of the first flight over the Alps by Chavez. Giacomo watched the event from the Pass of Sempione, which he had reached by his car. The last glass case tells us about the affective relationship between Giacomo and Ramelde's daughters and the village of Celle. The couple Franceschini used to spend their holidays in their home in Celle. In the letters exhibited, Giacomo calls playfully “care bambore” (dear dolls) the three nieces, and in particular Albina. He writes about his desire to reach the small village where he used to spend his summer holidays during his childhood. In October 1909 he wrote from Brussels to Ramelde: “When I will go back home, I am going to Pedogna (The valley to reach Celle). I will get scabies, if I don't do that”. 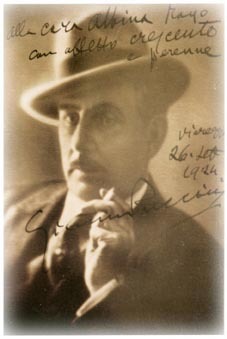 As you can see in the beautiful photo-postcards exposed, Giacomo Puccini went back to Celle for the last official visit on 26 October 1924, just over a mouth before his death in Brussels.